Clear plastic bottles with natural cork stoppers. Fill with layers of colored sand for intriguing effects. 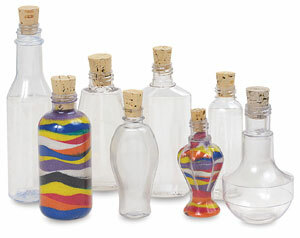 Small Bottle Assortment — A set of 8 traditional bottle styles in sizes ranging from 3" to 6¾" high. Large Bottle Assortment — Set of 6 bottles in different shapes, including Heart, Seashell, Football, Baseball, Stretch, and Dolphin.